3 in. thick fabric padded seat. Sturdy 1 1/2 in. oval steel tube frame. Fully upholstered back. Stain-resistant fabric. Fabric rated at 750,000 double-rubs. Meets or Exceeds ANSI/BIFMA standards. Weight capacity: 250 lbs.. Pictured in Navy. Seat size: 20 in. W x 19 in. D. Back size: 20 in. W x 16 in. H. Seat height: 18 in.. Overall: 20.5 in. W x 25 in. D x 33 1/2 in. H. Sled base steel frames are strong and stable, and the smooth black finish resists scuffs. The fabric is treated to resist stains. Easy assembly. 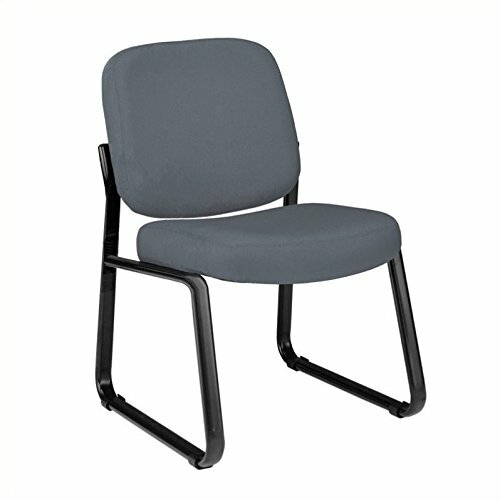 Perfect complement to our Model 403 Guest Chair with Arms.